What Is A Hot Water Re-circulation System? Do you have to run the water in the shower for several minuets before you get in the shower. If you answered yes, you need a Hot Water Circulating Pump for your home in Surprise? 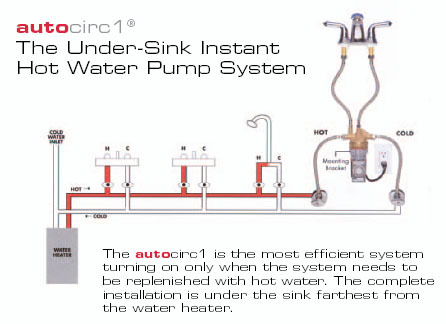 This system can deliver hot water to fixtures quickly without waiting for the water to get hot. Rather than relying on low water pressure, common in most water lines, recirculating systems use a pump to rapidly move water from a water heater to the fixtures. Not only do you not have to wait, you save money by not running water down the drain. Once you have a hot water recirculating pump installed, you will never want to go without one again. The old systems used to have a separate line that was connected to the furthest fixture in the home and ran back to the water heater to reheat the water and deliver it back to each fixture. The new Grundfos Comfort system circulates water back to the hot water heater by pushing the water into the cold system until the hot water arrives at the fixture you install the sensor on. The pump uses the main supply line, which eliminates the need to install a separate return line like the old style. 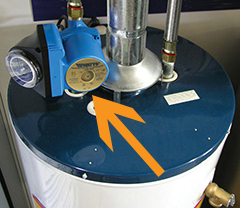 A small circulation pump is installed on the outlet pipe of the hot water heater tank. The sensor valve at your fixture provides the by-pass that allows the water to recirculate using the already installed cold water pipe line as a return line to the hot water. When the water temperature reaches 100.4 degrees F the valve will close to stop the circulation. Together the pump and valve provide instant hot water for every fixture and shower valve in the home. And there is even a timer on the pump so you can run it when you need hot water most like in the morning or at night when most people take showers and not during the day when your at work. Are There Different Recirculating Pumps Available In Desert Vista Estates? • A basic "always on" recirculating pump that uses the same amount of energy as a 40 watt light bulb. • A recirculating pump with a timer allows you to set times when the system is to be on for peak use and efficiency. • Recirculating Pump designed for Tank-less Water Heaters. This unit is designed for use with tank-less water heaters and is similar in function as the recirculating pump with timer listed above. Unfortunately, not all plumbing contractors and big box stores are very knowledgeable about the installation and maintenance of recirculating pumps. One of the more common mysterious problems we are asked to diagnose seems to be why hot water is coming out of the cold water faucets. Frequently, we find this problem is caused by an incorrectly installed recirculating system. Call the plumbing professionals at Option One Plumbing for installation of a new hot water recirculating system.